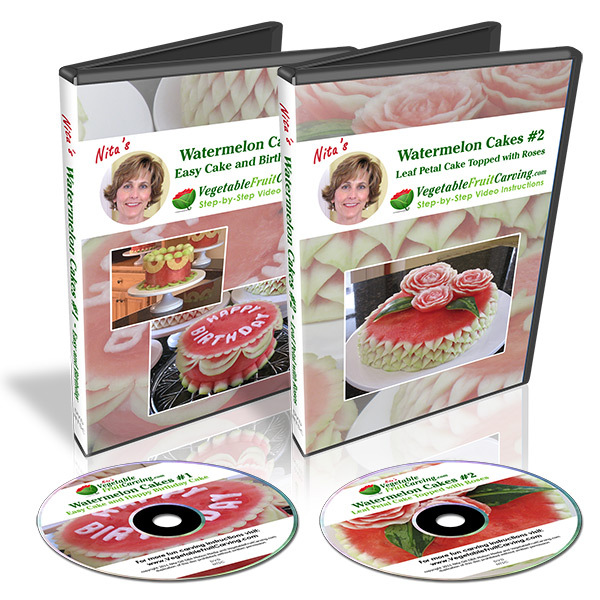 A couple of weeks ago, I announced my new video lesson that teaches a Scroll Watermelon Pattern that was inspired by a competition entry that I created a while back. 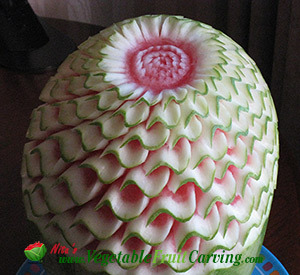 This is a watermelon carving pattern that people have been asking me how to carve for over 2 1/2 years now. Making a video showing how has been on my list of things to do ever since and now, it’s finally done! 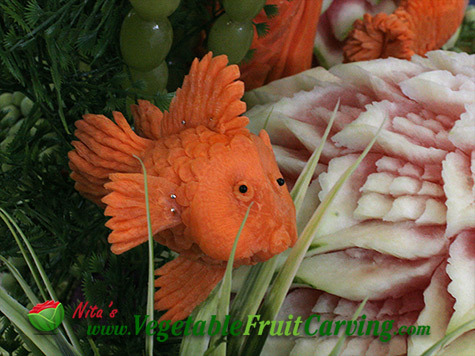 In this article, I’ll show you a short video that gives a “tour” of my First Prize winning Under Sea Garden fruit carving display that inspired the making of my Scroll Watermelon Pattern video carving instructions. I created it done for a competition called The Carve in Holland Michigan. 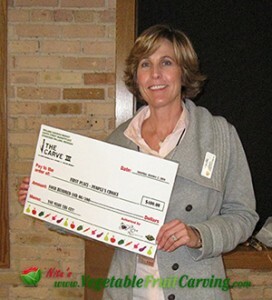 I was invited to be a judge along side Food Network Fruit Carving Champion Doug St. Souver for the Collegiate National Championships vegetable carving competition which was one of the events at The Carve. The organizer of the event, Greg Butauski asked me to compete in the Professional category. I wasn’t planning on it, and I was reluctant to do so, but he talked me into it. To my surprise, I ended up winning the first prize. 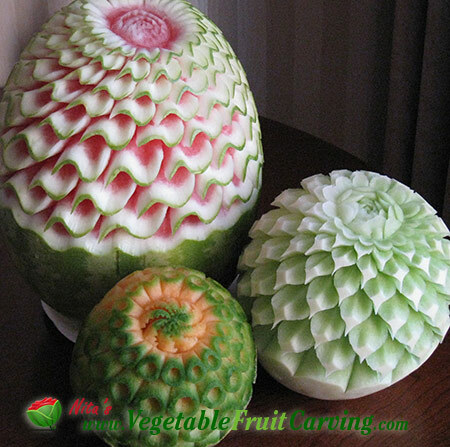 A number of people who were at the competition asked me how to carve the scroll watermelon pattern. And, once I got home and posted the photos of my Under Sea Garden on my website, started getting lots of requests asking how to carve this watermelon pattern. 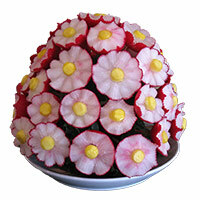 You can learn more about my Watermelon Carving Scroll Pattern video lesson by clicking this link. Here is a video tour of my Under Sea Garden. It’s quick. Only about 3 minutes. 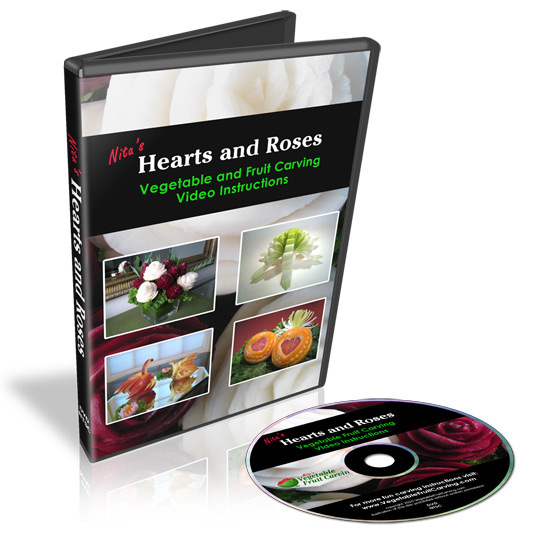 Maybe it will give you some ideas for carving and arranging your own fruit and vegetable carving displays. In looking back over the photos and video of those past events, I discovered that I had a bunch of great videos and photos that I have not yet shared online. So, look forward to my newer posts where I will be publishing some of those photos and videos. It’s so fun to see the creativity that shows up in these types of competitions. 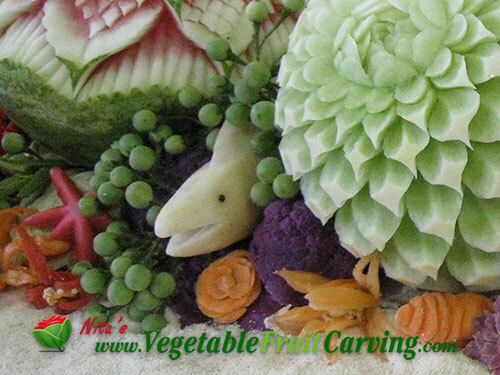 To see some of this year’s upcoming fruit and vegetable carving competitions, click here. If you want to carve my scroll watermelon pattern design, click here to learn more about my video lesson. 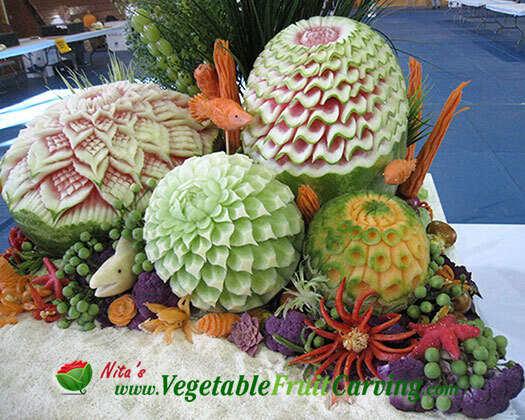 YOU ARE BEAUTIFUL AND YOUR FRUIT,VEG CARVING ARE BEAUTIFUL .ITS AWESOME SO I AM GOING TO BUY A VIDIO FOR MY SISTER FOR HER BIRTHDAY JULY 28 , I AM NOT A PRO BUT SOMTIMES I LIKE TO WATCH THEM AND ENJOYE THEM ITS KEEP MY STRESS AWAY. I WISH I COULD DO LIKE YOU OR MY SISTER. You are so sweet Mary. Thanks. You might surprise yourself when you carve. It is not as difficult as it seems when you are shown how. Me and many other carvers I know find carving itself a stress reducer. When I get focused on carving, I forget the cares of the world for a while. It’s a great feeling.